Stove-top broccoli recipes offer a quick and simple way to add flavor, color and loads of nutrition to any meal. Broccoli is high in dietary fiber as well as vitamins A and C. Farm-fresh broccoli is better for you than frozen, according to Linda J. Vorvick, MD, writing for the University of Maryland Medical Center's website, but as long as both are lightly steamed, they are nutritious additions to casseroles, soups and stews, possessing a strong flavor that goes well with almost any international cuisine. Cooking broccoli on the stove can be done in several ways, though boiling it not only leeches out many of the nutrients, it can destroy the texture. Wash fresh broccoli thoroughly and allow it to drain. If you are using a whole head of broccoli, cut the stem off and break the head into smaller pieces, or florets. Place an inch or two of water in the bottom of a small pot. It you have a steamer basket, place it in the pot, making sure that water comes just to the bottom of the steamer but does not cover it. Bring the water to a boil. Place the broccoli florets in the steamer basket or into the water at the bottom of the pot. Squeeze fresh lemon juice and sprinkle herbs and spices over the broccoli, according to your personal taste, or follow the recipe you’re using. Cover the pot and let the broccoli steam for about five minutes. Check the water level and add more if necessary. Recover the pot and let the broccoli steam for another five minutes or so, until it turns dark green, starts to soften and releases its scent. Drain well and serve. Follow Step 1 in Section 1, above. Make sure that you peel any thick stems since the outside flesh can be fibrous and tough, even when cooked. Heat a frying pan over medium heat until just hot. Add vegetable, olive or canola oil in a very thin layer that barely covers the bottom of the pan. Swirl the pan gently to make sure the entire bottom is covered. Let the oil heat for five to 10 seconds and then toss in the broccoli florets. Stir and turn them quickly with a wooden spoon or pancake turner. Add fresh lemon juice and herbs and spices to flavor. Soy sauce and sesame oil good complements for broccoli. Cook the broccoli, stirring and turning it every few seconds, for five to 10 minutes, or until it is done. Don’t overcook it or you sacrifice both nutrients and texture. 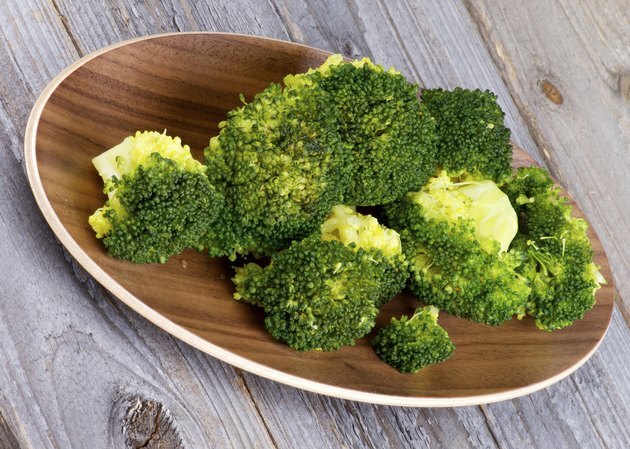 Cook broccoli ahead of time and then refrigerate it to be added to soups, salads and casseroles. Never add wet broccoli to hot oil, or it can splatter and burn you.